Phillip Taylor is a native Washingtonian who has been teaching private music lessons for over fifteen years. He really enjoys working with students of diverse backgrounds ranging in age from 5 to 85. 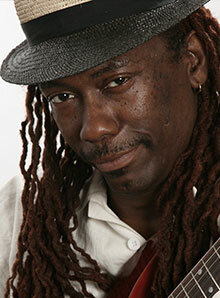 As a touring musician for more than thirty years, Phil has played everywhere from the Caribbean to Hawaii. He has played with Columbia Recording artist Olu Dara and toured with Washington, DC R&B icons Expressions. Phil has also played with rock bands Twisted Goddess, Earthqueen, White Jacket Jimmy and the Laboratory Rats, and Hold Your Ground. From the fundamentals of guitar to Blues to Rock and beyond, Phil uses his education as a graduate of the Guitar Institute of Technology (GIT) to help his students achieve their musical goals.While at GIT Phil was fortunate to study with Danny Gill, Steve Trevato, Allen Hinds, Joe Diorio, Ron Eschete, Keith Wyatt, and Barrett Tagllerino. While in DC, Phil studied with Paul Wingo, Chuck Underwood, Danny Leonard, and Mike Caruseo. Phil’s teaching philosophy is to help his students learn great basic skills in order to become self reliant, solid musicians. Whatever you want to play, Phil says it will be his honor to teach you.